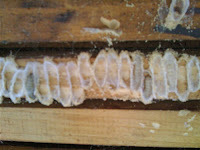 > Wax moth infestation- 5 ways to prevent this. We are getting lots of calls to the shop asking what products can be used to destroy wax moth eggs & larva and what can be done to prevent moths getting into your stored wax combs over the winter. 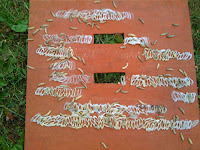 Wax moth Achroia grisella are a pest that plague beekeepers throughout Britain. 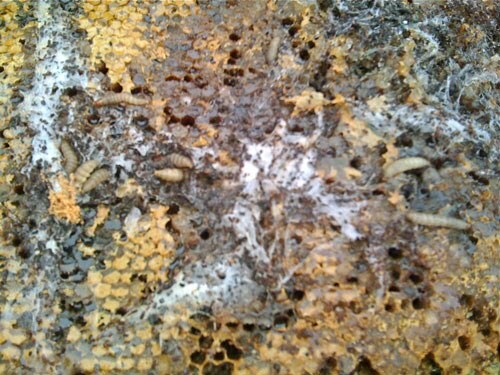 Feeding on honeycombs, they can quickly reduce a weak or unattended beehive to a webbing black mess destroying the combs. A strong colony will keep these moths at bay, chasing them out of the hive. The adult moth lays its eggs in the combs that hatch into large larva that tunnel through honeycomb, eating the wax and excrement black waste. 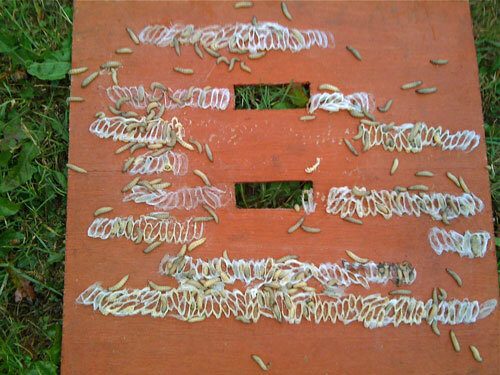 In its last stages of development the larva will pupates and burrows into any wood surface within the beehive. It forms a cocoon attached firmly to the wood that it will further develop within, emerging as a moth to carry on the cycle. This means any and all wood surfaces are badly damaged. The worst being the frames themselves. The typical area that wax moths burrow into are the underside of the frame lugs. This means that the entire frame structure is compromised as a result and can be thrown away. Protecting your stored equipment is a must. The Hive Honey Shop designed and developed a special storage bag precisely for this problem. The Super Bee Bag was launched at the 1995 National Honey Show where it received an award for this innovation to beekeeping. The bag is a specially designed heavy duty polythene bag approx. 1.6m tall, enough room to stack 7 supers or 6 brood boxes within. Once the boxes filled with frames are inside you can empty half a cup of Acetic Acid onto an absorbing pad placed on the top box. The fumes of the Acetic Acid fall rather than rise. Wear a mask taking care not to breath the fumes or have contact with your skin. The bag comes with a metal tie. Gather the bag, twist and tie to securely close the bag. The bag will slightly inflate as the Acetic Acid fumes expand, fumigating the boxes, frames and comb. This is a successful method to destroy not only wax moth eggs and larva, but nosema spores, acarine and amoeba contaminated equipment. Well air for 48 hours prior to applying to a live colony. The fumes do not contaminant or leave any traces in the wax or wood. You can also us paradichlorobenzene commonly know as PDF crystals as a fumigator, however these are not successful on combs filled with honey. Mothballs or naphthlene, a substance also found in air fresheners and insect repellents can be used as long as it does not come in contact with the comb or equipment. 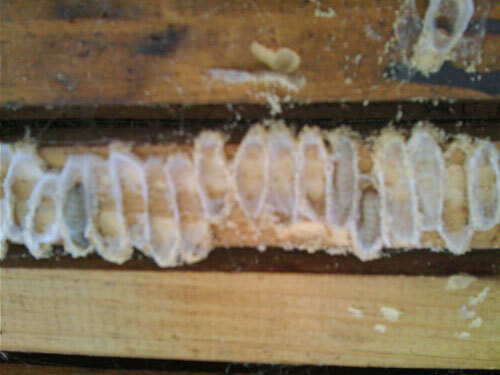 Direct contact can accumulate in the wax, which can kill the bees or contaminate the comb. Only use mothballs in and around the area where you store your equipment to discourage moths away from your area. Freezing the combs is another way to rid any traces of wax moths where the comb will be eaten or sold. Place the entire frame in a large deep freezer and leave it for one week to freeze. Carbon Dioxide is used on a larger scale to fumigate honey filled combs. 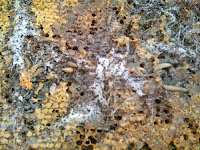 Some ‘spray on the comb’ solutions are sold to kill wax moth eggs and larva on the combs. You spray this product on the face of each comb. We only use methods where no contamination or lasting trace elements to the honeycombs can occur. Using this method could result in a build up over time. 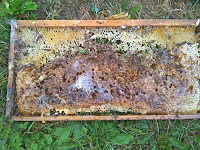 To date no traps have been found to completely protect beehives from wax moth infestation. So being vigilant, keeping your equipment clean and well protected is the only sure way to minimise wax moth infestation.